Small airboats are just plain lots of fun! They can run in shallow rivers, lakes, or swamp water. Many are original designs, where the builder starts with a wide beam jon boat, a small 13 to 50 HP two or four stroke engine, and a little ingenuity and end up with a fun toy or work horse. At diameters less than 48 inches, the Ultra-Prop can be run direct drive on the four stroke Honda, Vangard, Predator, or similar engines. For these applications, we carry prop flange kits that will allow the Ultra-Prop to be fitted directly to the engine. Prop Flange Kit - Kit includes a taper lock bushing and matching modified sprocket to provide the interface between keyed, straight shaft small gas engines and the Ultra-Prop. Also provided is a “crush” or backing plate, mounting hardware and key. Available for shaft sizes from 3/4" to 1 1/2". Prop Flange Kit with Pulley - Prop Flange Kit with 6" diameter pulley for driving an alternator. This is a popular setup when a light bank is used for night fishing. Kit includes flange with pulley, taper lock QD bushing, two propeller backup plates, six tubular spacers, all hardware and key for straight shaft. Available in shaft sizes from 1" to 1 7/16". Dozens of companies also build ready to go airboats. Several OEM companies such as Overboard Custom Boats, Krestas Boats, Sonny's Marine, and Vantage Marine use the Ultra-Prop propeller as an air-drive. For Flounder gigging these small power units are ideal. Operators add an automotive alternator to the small engines to power the large bank of lights used for the night fishing. Married to the Ultra-Prop, it becomes an inexpensive and effective power package. The Ultra-Prop is a very popular choice with bow fishing enthusiasts. They also use small engines with propellers to make an air drive. This system allows them to move in shallow water and through grasses to find their prey. The Ultra-Prop is very tough and impervious to water and therefore ideal for this application. The Ultra-Prop can be easily cut down from 59 inches (Ultra-Prop I) or 66 inches (Ultra-Prop II) to any smaller diameter required without affecting balance. The pitch can be changed to meet the load requirements. The glass or carbon reinforced nylon blades are very tough and can withstand the water and soft vegetation environment with no damage. Google "small airboats" and look at some of the models available or for ideas to design and build your own. 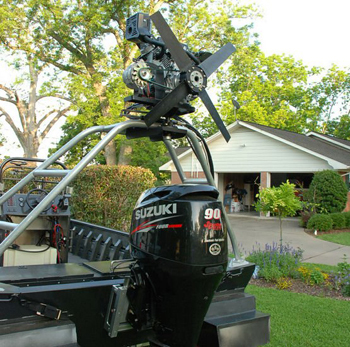 An example of builder ingenuity: Ron Spiering used two engines and Ultra-Prop I propellers to build a successful airboat that uses throttles for steering and eliminates the conventional rudders. He has also considered using one engine in the bottom of the boat driving a hydraulic pump and using two hydraulic motors to drive a pair of Ultra-Props.